It’s June 12, 1980. Exactly 20 years to the day before Alan Shearer will lead out the England football team for the opening game of the European Championships, Kevin Keegan is performing the very same job – a captain leading out his own England side for their first match of Euro ’80. Despite having been England’s leading striker through the best part of the 1970s, this is his first major tournament on the international stage and he is feeling bullish. Having performed at the highest club level with both Liverpool and Hamburg, having lifted the UEFA Cup twice, the European Cup once, and having been voted European Footballer Of The Year in both 1978 and 1979, Keegan has no reason to believe that 1980 will deliver any less success. This year he has high hopes. This year he is confident of securing his first international honour. Kevin Keegan doesn’t just want to win Euro ’80 – he wants to win it in style! It’s April 20, 2000. The European Championships are getting ever nearer and for Kevin Keegan the sense of anticipation is building. As England captain he had led his country to the European Championships of 1980, only to face the bitter disappointment of that early flight home. As a player he failed to land Europe’s biggest international football prize. As a manager he intends to do better. Today, with just over seven weeks until the big Euro kick-off, he is at the Benwell Football centre, one-time training ground of Newcastle United. He’s been a regular visitor here in several guises – as a Newcastle player, as Newcastle manager and, today, as manager of the England team. He’s about to throw himself into ‘entertainer’ mode, taking a field full of kids through their paces like Norman Wisdom in football boots. But just for a few minutes he faces the press. They’re asking him about Joe Cole because the news of his broken leg has just broken big; they’re asking him about the demise of English club football in Europe, and in particular about Manchester United who were knocked out of the Champions League by Real Madrid only the previous evening. Then, with national issues done and dusted, it’s down to the local questions for this former local hero. There’s a sharp intake of breath. Keegan flashes a mischievous grin and the crowd are brought to tears of laughter. But that’s what Keegan does best. Manager of the England football team he may be, a patriot to the core, but he’s an entertainer too. When Kevin Keegan walks into a room, you see faces light up! When Kevin Keegan walks into a room you know about it! It’s September 8, 1999. The Wojska Polskiego Stadium in Warsaw is dark and the 1500 travelling England fans are silent. Silent because of the result. Silent because of the barrage of fireworks that have rained down on them like a mortar attack. Silent because the match has long since finished. It’s the usual ritual for an England fan away from home. Held hostage in a near-to-derelict stadium for an hour after the final whistle, until well after the last of the locals has made their way home – and definitely well after the last bus or tram has run its final course. Outside waiting for them are the phalanx of menacing-looking riot police, also standing silent, humourless, each with one hand firmly clenched around the handle of a baton – just in case! It’s going to be a long walk back to the town centre tonight, to whatever hotel or bus shelter will provide a home for these fans. A gentle murmur ripples though the waiting crowd – and then the fans break into spontaneous applause, charging to the front of the ageing terrace, cheering and clapping. The riot police tighten the grip on their nightsticks and wonder what has prompted this explosion of emotion. Kevin Keegan, it appears, has been sighted making his way along the track that runs between the pitch and the 20-foot-high metal fence that seems a throwback to football from another lifetime now. He’s on his way to do his bit for the media – but he just can’t pass that applause without saluting the fans. Applauding them for their support, for the sacrifices that many of them have made to be there, for the danger that so many have put themselves in while following the three lions. Kevin Keegan understands – and the fans know that. It’s not spoken of very often, but there does seem to be a special relationship between Kevin Keegan and the travelling England fans – a kind of two-way respect. Bobby Robson might have been loved like the chalk-stained science teacher you recall with some kind of begrudging admiration, and Terry Venables like the geezer down the pub who’s going to ‘do you a favour’, but Keegan is more than an acquaintance – to the fans, he’s ‘one of them’. He manages his teams from the heart. He’s the ‘People’s Manager’. But why you? What’s the trick to this instant popularity game? “I suppose I’m their choice because they can relate to me,” he rationalises. “Hopefully they understand that I’m not trying to kid them, I’m not trying to fool them and I’ve got a pretty good relationship with them. In the past certain England managers have tried to send them down the wrong route, be a bit above them… to not give all the truth. Admittedly, it’s very difficult in our job because you don’t want to do things like give your team away too early, but the rapport with the fans is important. Maybe for me it all goes back to my playing days. Keegan is not just the People’s Choice, he seems to have been the choice of the England players too. But why is it that people warm to him? Why is it that players who could barely raise a smile at the thought of a few hours with Glenn Hoddle would seemingly walk over hot coals to train with Kevin Keegan? An extraordinary man-manager certainly, has this ability to gain a player’s trust been borne out of the long-harboured resentment of losing his own England career without so much as a ‘Thanks, but no thanks’. Back out on the pitches of the Benwell Football Centre, Keegan continues running around the Adidas Coaching Day like it was his own personal adventure playground. Around him he is ably assisted by young coaches who were youth team players on the books at Newcastle when he was manager. He’s also informally putting the newest, brightest young Geordie prospect though his paces. In the corridors of St James’ Park the whispers are that England Under-16 international Michael Chopra might be the real thing, an eventual successor to Alan Shearer, but today he looks barely older than the kids he is helping Keegan to coach. It’s June 12, 1980. Kevin Keegan leads his England team onto the pitch of the Stadio Communale in Turin for their first match of the European Championships. At home a success-starved nation has placed a heavy weight of expectation on the England captain, as he leads the country to their first major tournament game since Mexico ’70. It may have been ten years since England have competed at this level, but they are expected to beat Belgium in their opening game just by turning up. The tournament starts badly, however. After two decades in existence, the European Championships have yet to capture the imagination of football fans across the continent and a crowd of only 7,000 turn out for the game. Instead of being the guaranteed ‘banker’ that England have been expecting, the two team’s share the points in a game marred by crowd violence between English hooligans and locals. With the over-zealous Italian police unleashing enough tear gas to quell the terrace-fighting, a change of wind-direction means that the game has to be halted while players on both sides fight off the effects of the tear gas. In the subsequent group match – a 1-0 defeat by the hosts – Keegan is effectively marked out of the game by Marco Tardelli, who still finds time to pop up and score the Italian winner. A 2-1 victory over Spain in the final game fails to lift spirits and England are out of the competition and on their way home. “We just weren’t good enough,” recalls Keegan. “We could always put a good side out but we couldn’t field an exceptional side. I think at the moment now, with the players that I’ve got to choose from for Euro 2000, we really have got the chance to put out an exceptional side. In my day we could almost put out two teams that were as good as the team we were playing. You could switch Trevor Francis and myself for example, or you could put Glenn Hoddle in for Trevor Brooking, and although they were different players, it never really took the team up or down in any way. We had probably 60 players who were all pretty much the same, but we just didn’t have too many outstanding players – and that’s what you really need at international level! But wasn’t it a big personal regret for Keegan that he never had the opportunity to shine of the big international stage? That despite ranking among the great England internationals, and landing major individual accolades such as the European Footballer Of The Year award, he never really did it when the whole world was watching? Do you look at Michael Owen now and think ‘go on son, do something that I couldn’t’? If the England team today are better than the one that Keegan graced at Euro ’80, he also thinks the tournament itself has changed out of all recognition. Not only is it a bigger, slicker, all round festival of football, but it should prove to be a far less violent affair on the terraces (sorry, in the all-seater stadia). Having had to stand in the centre circle and witness rioting England fans at their worst, 20-years on Keegan is fully committed to the English FA’s anti-violence campaign: ‘Football Yes, Violence No!’. There’s no way he would want to see a debacle similar to England’s Euro ’80 opener blight his squad’s chances of success in Holland and Belgium this summer – but similarly, he doesn’t want to see England fans again put in a position of danger. After all, when the fireworks started flying in Poland last year, Keegan was quick to put his neck on the line by pointing to the unprecedented provocation faced by England fans who were, quite literally, in the firing line! “There have been massive strides made by everybody to counter football hooliganism,” he says, “but there’s still some way to go. Not just in England, but in Germany, Holland, Belgium and in other countries too. When you have masses of people you’re always going have problems if it gets out of control, but I really think it’s much better now than when I was playing the game. Football was at an all time low then – and I don’t think that it couldn’t have got much worse than it did back then. There have been big improvements since those day. The stadiums are much better now and there’s been massive strides taken to improve every aspect of the game, but we’ve all really got to keep working at it. Now style, along with flair, have been words forever associated with Kevin Keegan’s managerial career. 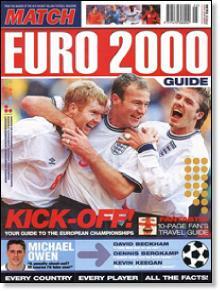 But in the run-up to Euro 2000, there has been a noticeable sea-change in his thinking. Where once at St James’ Park his cavalier attacking style made Newcastle United every football fan’s second favourite team, in the England hot-seat he seems taking a far more pragmatic approach to Euro 2000, admitting that what he really needs are players who can ‘go and do a job’ for him. There’ll be no messing about for Keegan this summer. Sure, he still likes way-flash attacking football, but at present he’s focussed on nothing less than winning! “The England job is different to club management,” he reasons. “In club management you can work with your players every day – and twice a week you get a chance to play a game. One result going against you if you try something different is not a disaster, but when I took over the England team we had to win every game to qualify. We had to get a certain amount of points… we were never going to win the group, we could only finish second and we’d already played away to Sweden and at home to Bulgaria. Discounting the Luxembourg result – everyone was going to beat Luxembourg and goal difference didn’t count – we’d got only one point out of six, so the name of the game then was to qualify at any cost. And we managed to do that, albeit not in the way we’d have all wanted. But I think as time goes by, as the players get used to me and as I get a bit more time with the players, things will improve – that’s the key and that’s what it’s going to be like at Euro 2000. “You can’t think like that,” says Keegan, dismissing the idea out of hand. “It doesn’t work like that. The opportunity came along – and it really did come at a bad time for me, because I wanted to finish off what I’d started at Fulham. I don’t regret taking the job, but I really do regret that I had to leave Fulham before I could finish what I had started. The England job doesn’t come up on demand though – it only comes up every now and again and a lot of things have to work for it to be right for somebody. And it was right for me at that time! With the coaching finished at the Newcastle Football Centre, Kevin Keegan is winding down – and talk inevitably turns again to the European Championships. Four years ago as a TV summariser, Keegan had the second best seat in the house as Euro ’96 unfolded in all its glory. Football fans from all over Europe turned on, tuned in, and freaked out to the continent’s biggest football celebration yet. It was a fabulous tournament, boasting players who could thrill and teams who could excite. It was brought to life by colour of the Dutch, the flair of the Portuguese, and the drama of the penalty shoot-out; it boasted the glorious goal-celebrating excesses of Paul Gascoigne and the breath-taking exhilaration of Oliver Bierhoff’s golden goal Final climax! And talking of talent, what of England’s most outstanding star, the player who can turn a game as well as he can fill newspaper column inches. Will this be the stage where the lad who married a Spice Girl really asserts his international credentials? Is there more to come from David Beckham? Euro 2000 is shaping up to be the complete festival of football, bringing together some of the world’s greatest players. Keegan is a football fan, for sure, but he’s a patriot first and foremost. Ask which of Europe’s finest he’s looking forward to seeing most – Kluivert? Raul? Figo? Van Nistelrooy? – and you’ll hit a brick wall painted with the flag of St George. “I’m excited about seeing my own players most of all,” he laughs. “I’m excited about them all for different reasons. Tony Adams and Alan Shearer excite me just as much as the youngsters, Michael Owen, Steve Gerrard, Kieron Dyer and young Richard Wright. Every single one of the players excites me and hopefully when they’re picked and chosen to play in the team they’ll excite the fans. Okay, so Kevin Keegan isn’t focusing on the big foreign stars, but what about the other teams in this European nations cup? Does he already know everything he needs to know? Has Keegan a Revie-style dossier prepared for each opponent, or is he simply laying down his beach-towel on the Charleroi bench in anticipation of the all-important clash with the Germans? But what if it’s not Holland. What if fate is a little unkind? Imagine it’s Rotterdam, 10.21pm on Sunday, July 2. It’s England v Germany in the Euro 2000 Final and it’s gone down to the penalty shoot-out. Gareth Southgate steps up to take the decisive fifth penalty. What would you do Mr Keegan? The England gaffer laughs out loud at the the suggestion. “Why on earth would you have Gareth Southgate taking the penalty?” he quizzes. Surely it’s the dream scenario. Surely you couldn’t script a more convincing way to heighten the tension. Don’t you just love the theatre of the penalty shoot-out, Kevin?